What is the best definition of an Organization? Habits. Yes Habits! Tasks, Procedures, Systems, Employees, and Management are all Habits-Driven. Each person knows their job by having the right knowledge, habits, and efficiency of implementation. Learning is crucial if it leads to the creation of meaningful useful habits that nourish Performance and Sales. The glue to designing good organizations is the concept ‘Habit Accountability’ – each one of us will slack off if left to our own devices, but when we are part of a larger Organization our habits are part of a larger whole; they contribute to the organization health and growth. 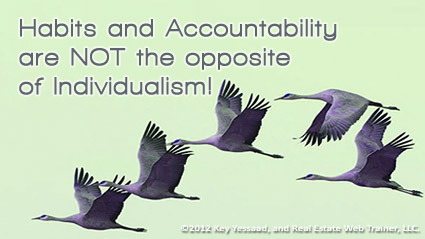 It is unfortunate though that the percentage of Real Estate Brokerages that are built on ‘Habit Accountability’ are few and far in between; the fierce independence of some Real Estate Agents leads to rogue individualism that shuns accountability from the brokerage; and the irony of is that it ends up hurting the production of said agents, and of all the brokerage – go figure!